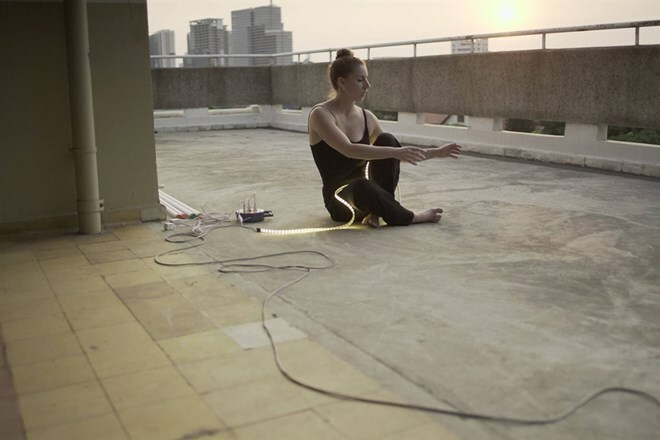 HCM City (VNA) - A new dance Bleu Neon co-created by Vietnamese and French contemporary dance artists will be staged at the Factory Contemporary Arts Centre in Ho Chi Minh City’s district 2 on March 22. The dance, a collaborative project of French-Vietnamese dancer Kim-Sanh Chau and Camille Lélu, and Vo Hong Nhung of Vietnam, is the result of a month-long residency programme at Villa Saigon initiated by the French Institute in HCM City and the city-based Dancenter. In Blue Neon, the artists use lights collected in the city during their residency to represent the city’s culture and history. The performance will consist of independent and simultaneous dances. The full version of the dance is expected to be completed during a residency programme in Brigittines, Belgium in April 2020. It will premier in Montreal, Canada in autumn 2020. Chau, based in Montreal, was trained in dance in France and Canada. Her choreographic works have been presented at dance festivals in France, Canada, the Republic of Korea, Malaysia and Vietnam. She is also a screen-dance filmmaker. Her works, mostly collaborative, have been screened in Canada, Colombia, Germany, France, Italy and Vietnam. She was awarded Best Director by the 2017 Festival Quartiers Danses in Montreal for her film Inner Smoke. Chau is artistic and general co-director at Studio 303 in Canada. Meanwhile, Nhung received many local dance prizes and awards when she was a child. In 2009, she began her professional dance career with Urban Dance Group as a solo dancer and instructor in ballet and contemporary dance. She became a teacher of ballet, jazz and contemporary dance at Dancenter in 2013. Lélu studied at the Epsedanse School of Dance Teaching in Montpellier Hérault, France. She was awarded first position in the European dance contest at the French Federation of Danse in 2007.